Description: 7400, 7401 Electric Strikes with 4-7/8” faceplates are designed for Adams Rite deadlatches or cylindrical locksets with 1/2” to 5/8” latchbolt projection. For use in aluminum jambs and stiles. Opens electrically under 35 lbs. of preload. 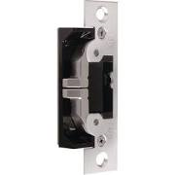 Description: 7440 Electric Strikes with 4-7/8” faceplates are designed for Adams Rite deadlatches or cylindrical locksets with 1/2” to 5/8” latchbolt projection. For use in hollow metal or wood door jambs and steel or wood doors. Opens electrically under 35 lbs. of preload. Function: Remote electrical control of any door equipped with an Adams Rite 4500, 4700, or 4900 Series (or similar) Deadlatch or cylindrical (key-in-knob/lever) type lockset with 1/2” to 5/8” latchbolt projection. Electrical actuation unlocks strike jaw, releasing latchbolt so door can be opened without operating latch itself. Extremely compact mechanism fits into aluminum jamb (or opposing door) sections as shallow as 1-1/16”. Direct upgrade for Adams Rite 7100 Electric Strikes. This non-handed strike features an ultra-compact design and an adjustable stainless steel split-jaw with over 1500 lbs. of holding force in fail-secure mode. The strike releases electrically with up to 35 lbs. of door “preload” (pressure exerted on doors by air conditioning systems, warping or misaligned hardware which can disable common electric strikes). Single solenoid operates on 12, 16, or 24 volt AC/DC power. Strikes are equipped with a quick connect plug-in type connector. Fail-Safe/Fail-Secure: Field selectable at time of installation. Case: Approximately 1” x 3-3/8” x 1-1/16” deep. Strike Lip: Basic 7400 electric strike has lip of proper length for 1-3/4” thick door that closes flush with jamb edge. Where door thickness or jamb shape differs from this configuration, lip extension kits are available. Not available on 7401. Strike Opening: 5/8” adjustable x 1-7/16” x 1/2” deep. Bolt retainer jaw is stainless steel. Strike accepts bolt of Adams Rite 4500, 4700 (discontinued), or 4900 Deadlatch or cylindrical latches. Faceplate: Measures 1-1/4” x 4-7/8”. 7400 has flat faceplate; 7401 is radiused to match nose on inactive leaf in a pair of aluminum stile glass doors. Available in a wide range of architectural finishes. Voltage: Field selectable to match power source of 12, 16, or 24 VAC/VDC.